NASA employed the services of Raymond Loewy Associates from 1967 until 1973. Loewy's firm produced over 3,000 designs for NASA during this period. 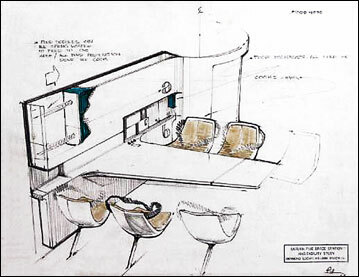 Loewy's industrial design agency served as habitability consultant for Skylab, the Space Shuttle and the International Space Station. 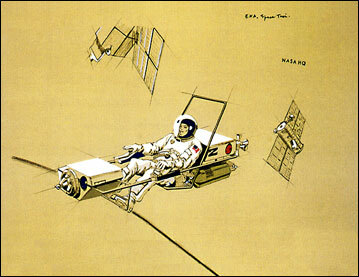 Prior to Skylab, NASA designed its vehicles like aircraft cockpits, providing basic life support as the guiding principle. Engineers at NASA tended to stress functionality and reliability. Loewy was to insure the welfare of the astronauts by making them more comfortable in the cold, alienating confines of space. Loewy was better known for his designs for clients like Studebaker but he should also be remembered for his contributions to NASA for a timely vision of a space-bound future. 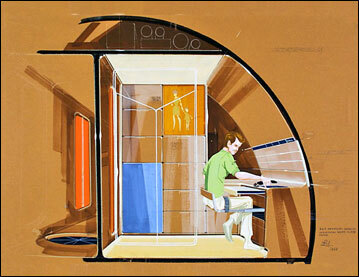 Drawing by the Loewy studio for an artificial gravity stateroom with individual work and sleep mode. Saturn Five Space Station habitability study for a meeting space. Habitability study for Extra Vehicular Activity. 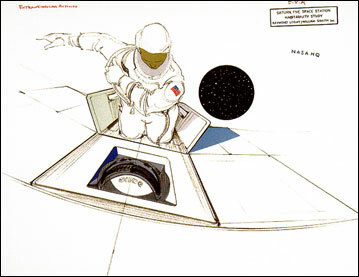 Habitability study for an EVA space taxi.